Figure 5.4. Scheme of ribosome dissociation into subunits. Some factors inducing the dissociation and promoting the reassociation are indicated. by the sedimentation patterns shown in 5.3. The dissociation is reversible. The restoration of a proper Mg2+ concentration and the removal of dissociating agents result in reassociation of ribosomes. The reassociation is also promoted by Ca2+, diamines and polyamines, and alcohols. 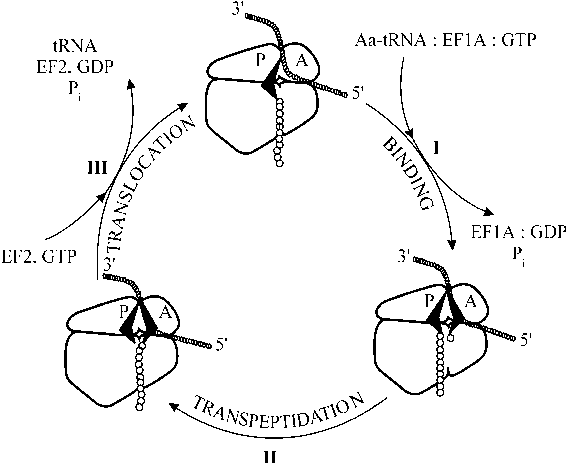 Some factors contributing to and counteracting the dissociation of ribosomes are indicated in Fig. 5.4. After dissociation, the ribosomal subunits can be separated in the preparative ultracentrifuge, and then studied individually. A unique asymmetrical shape of each of them has been detected and is described below. Different electron microscopic projections of the bacterial (Escherichia coli) ribosomal 30S subunit and the corresponding crude morphological model are shown in Fig. 5.5. The 30S subunit is somewhat elongated, and its length is about 230 A. The subunit may be subdivided into lobes which are referred to as the "head" (H), "body" (B), and "side bulge" or "platform" (SB). The groove separating the head from the body is quite distinct. The eukaryotic 40S subunit has a similar morphology, although two additional details of structure may be mentioned. The first is a protuberance, or "eukaryotic bill" on the head. Second, the end of the body distal to the head appears to be bifurcated due to the presence of some additional mass; this bifurcation is referred to as the "eukaryotic lobes" (Fig. 5.6). Figure 5.5. Electron micrographs of individual 30S ribosomal subunits of E. coli and a model of them in three projections (V.D. Vasiliev, Acta Biol. Med. Germ. 33, 779-793, 1974). The upper two rows show metal-shadowed particles, prepared as described in the legend to Fig 5.2 A. The next two rows show uranyl acetate-stained particles, prepared as described in the legend to Fig. 5.1. The lower row is the model. The left column is the images of the 30S subunit and its model in the projection when it is viewed from the side opposite to that facing the 50S subunit in the complete ribosome. The middle column is the images of the 30S subunit and its model in the narrow side (frontal) projection. The right column is the images of the 30S subunit and its model in the projection when it is viewed from the side facing the 50S subunit in the ribosome. (Original photos by V.D. Vasiliev). Figure 5.6. 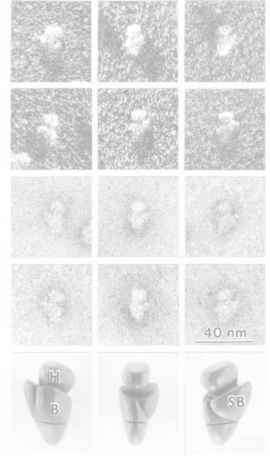 Electron micrographs of the individual 40S subunits of rat liver ribosomes and a model of them in three projections (V. D. Vasiliev, O. M. Selivanova, G. Lutsch, P. Westermann, & H. Bielka, FEBS Letters 248: 92-96, 1989). The upper two rows show metal-shadowed particles, prepared as described in the legend to Fig. 5.2 A. The next two rows show uranyl acetate-stained particles, prepared as described in the legend to Fig. 5.1. The lower row is the model. Three columns of images are the 40S subunit and its model in the same projections as those for the 30S subunit shown in Fig. 5.3. (Original photos by V.D. Vasiliev). projections; the bifurcated tail, or eukaryotic lobes, are also prominent. 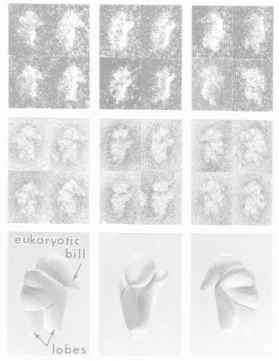 It should be noted that the small ribosomal 30S subunit of archaebacteria (archaea) has a morphology which is intermediate between that of the eubacterial 30S subunit and the eukaryotic 40S subunit: the archaebacterial subunit has a characteristic bill on the head but does not possess the eukaryotic lobes at the end of the body.